A few months ago the European Commission released their new project for young Europeans: the European Solidarity Corps. E&M investigates what this initiative is, how you can get involved and what does it mean for young Europeans’ futures in an increasingly turbulent Europe. Hi there, thanks for agreeing to speak with E&M! To begin with, maybe give our readers a quick introduction to who you are and what you do? My name is Floor van Houdt. I work for the European Commission’s Directorate-General for Education, Youth, Sport and Culture. I’m managing the unit that deals with Youth, Volunteer Solidarity and Traineeships. We promote policies and actions in favour of young people, in cooperation with the Member States and youth stakeholders. This includes the Erasmus+ Programme’s youth strand, and, more recently, the implementation of the European Solidarity Corps. So what exactly is the European Solidarity Corps? 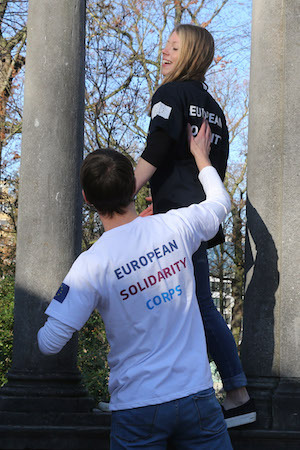 The European Solidarity Corps is an EU initiative proposed by President Juncker in his State of the Union address in September 2016 with the aim of allowing 100,000 young people to get involved in solidarity activities across Europe by 2020: helping where help is needed most. To name just a few examples, this could be support to newly arrived refugees, caring for other young people’s educational needs or getting involved in an environmental clean-up. Participants will have the opportunity to be placed with a project either as a volunteer or for a traineeship or a job, or to be involved in grassroots projects dreamt up, designed and implemented by young people themselves. These solidarity activities could take place either in the countries where they reside or abroad for – in most cases – 2 to 12 months. We have set-up a European Solidarity Corps Portal where young people who are willing to contribute can enrol and where registered organisations, which first need to be checked and receive a quality label, can get in touch with committed young people. More than 31,500 young people have already registered via the Portal which is proof of their commitment, their wish to contribute to change, to make a difference for a better Europe. We specifically want to ensure that the European Solidarity Corps is for everyone. This is why we are planning specific support to ease access to the Corps for disadvantaged youth. Why was the European Solidarity Corps set up? Solidarity is a guiding value for the EU which, in the words of President Juncker, is the glue that keeps Europe together. It is part of the other values we share in the EU like human dignity, freedom and equality which are defined in the EU Charter of Fundamental Rights. The European Solidarity Corps will create opportunities for young people willing to make a meaningful contribution to society and help show solidarity – something the world and our European Union needs more of; and something many young Europeans are keen to give. We have all seen young people’s commitment in welcoming and hosting refugees, in addressing climate change, or supporting those who – for reasons of poverty, for example – run the risk of living on the fringes of society. In addition, although youth unemployment has decreased continually since 2013, it is still too high in several regions of the EU. The activities under the Solidarity Corps will allow participants to develop their skills and qualifications, and more broadly their human and social potential. In this sense, the Solidarity Corps is a way for participants to develop their professional careers. Little more than a month ago, we presented a proposal to widen the scale and scope of the Solidarity Corps even more, with additional funds and new opportunities being made available. For instance, we know that while 25% of young people in the EU say that they have been involved in organised voluntary activity in the past 12 months, only 6% of young people have volunteered abroad, a low figure, if one considers the added value young people gain in terms of language learning, employability, intercultural awareness, self-confidence and personal development if they do a volunteering service in a country other than their resident country. 88% of those young people who have not volunteered abroad say that it’s because they did not have the opportunity. How does the European Solidarity Corps differ from the European Voluntary Service? Until the new proposal to strengthen the European Solidarity Corps is in place next year, the Corps depends on its eight underlying funding programmes, one of which is the Erasmus+ Programme and its European Voluntary Service. You can imagine the European Solidarity Corps in its current form as an umbrella bringing all those programmes together, basically maintaining these programmes’ rules. However, although the European Solidarity Corps builds on the experience and structure of the European Voluntary Service (EVS) and other programmes, it is much broader. The Corps notably includes an important innovation as it provides job and traineeship placements. In addition, the European Solidarity Corps provides a central registration tool so young people do not need to look themselves for places. This tool provides organisations with the biggest pool of motivated young people interested in solidarity activities and contributes to creating a community of like-minded individuals around solidarity. Finally, the Solidarity Corps provides new opportunities not only in qualitative terms, but also in quantitative terms: whereas the European Voluntary Service provided 100,000 placements over the past 20 years, the European Solidarity Corps has the ambition to provide the same number of placements by the end of 2020, in only four years. How can young Europeans get involved in this initiative, and who exactly is your target audience? It’s very easy. Young people interested are invited to go on the European Solidarity Corps’ website and sign up in the database indicating basic information about themselves, their motivation, skills and preferences for the kind of activity they’re interested in, their availability and type of placement. Our target audience is anyone between 17 and 30 years old, who is a national or legally residing in a participating country. The minimum age to participate in a solidarity project is 18. We encourage especially also young people from disadvantaged backgrounds to get involved and see how empowering a solidarity experience can be. How does this project aim to fight rising inequalities between young Europeans? The European Solidarity Corps aims explicitly at involving young people from disadvantaged backgrounds. In our recent proposal, we have included targeted measures to lower the threshold to participate and ease access of this target group, such as additional funding for organisations and businesses involving disadvantaged young people and placements of shorter duration and in-country placements, group activities and solidarity projects. In addition, solidarity has a ripple effect. Our studies tell us for instance that participants involved in international volunteering activities get a much better understanding of the challenges disadvantaged parts of the population face. So the Corps, like current activities, addresses inequalities at different levels: through the involvement of disadvantaged young people, by making all participants better aware of the challenges parts of our societies face and by addressing these challenges with their projects. Thanks again for joining us. Do you have anything else to say to our readers? Thanks for this opportunity to speak about the European Solidarity Corps. I would just like to encourage young people to never stop exploring new opportunities in their home country and abroad, opportunities to volunteer and work together with others, to always discover new worlds, new cultures, new people. This can be so incredibly important for our own development, be it from a more personal or more professional point of view. Just dare to take the first step and you will see a totally new world opening up to you. Mrs Floor van Houdt is working in EU youth affairs within the European Commission’s Directorate-General for Education and Culture since 2009. She is Head of Unit in charge of youth, volunteer solidarity and traineeships. Mrs van Houdt has been working for the European commission for more than 20 years and has dealt with youth, research, entrepeneurship nd maritime policies. 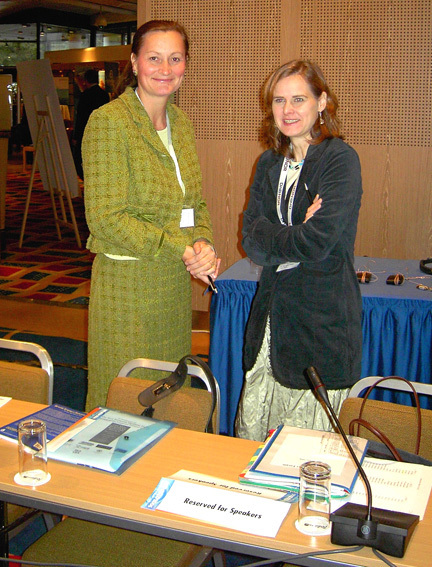 Prior to that she worked as a European affairs consultant. She studied law and European studies in the Netherlands, Spain and Belgium.